In fact, this set arguably is the closest yet to the core concept of the Ideas platform, or at least the way I always conceived of it (and was duly disappointed when it seemed to become overrun by IPs). It uses loads of basic parts and has a wholesome, educational subject that fits well with The LEGO Group's brand values. I'm so glad it made it through - it took 20 months for Tom to achieve the required 10,000 votes, so his project would not have succeeded under the new rules introduced recently which archive projects after 12 months. We don't normally discuss box art on New Elementary but I have always been a huge fan of LEGO boxes and still own many from my childhood. This one is so charming and successful, I feel compelled to describe it. Four sides mimic a wooden box with leather straps, with watercolour paintings of plants stapled to the front and photographs stapled on the rear along with a world map. This map highlights that each of the provided species are from a different continent; Tom has been diligently creating series of bird models representing continents of the world. 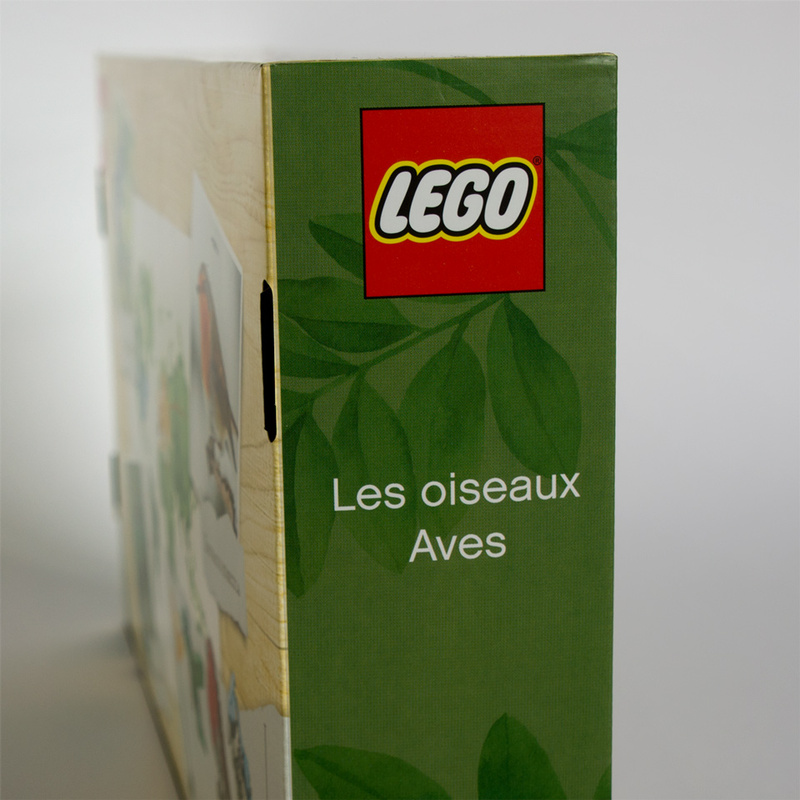 The other two sides have a simple green pattern with leaves; the only information being the brand logo and the French and Spanish translations of the set name. Such romantic-sounding words! No-one will confuse this set with the animal sets available in the Creator line, and it will look completely at home in trendy gift shops. Like all Ideas and Architecture sets, it's a flip-top box containing high quality bound instruction booklets. I was surprised to find three booklets; one for each bird. This means you can build the set with two friends, which would be fun had I not greedily wanted all three for myself. Each booklet starts with an identical introduction to the set before describing the specific bird; all of this is then repeated in French and Spanish. Each bird comes on a smart display stand lined in Sand Yellow [TLG]/Dark Tan [BL] tiles and the name of the species printed onto a Black 2x4 tile (Element IDs 6115328, 6115331 & 6115326). This conveys the same kind of professional feel you get from Architecture sets and highlights the geeky ornithological attitude of this set. Each method of attaching the bird to the stand is different, which is a nice touch, and kind of impressive given each support needs to bear significant weight. They detach from their stands with ease, and the robin and the hummingbird can also be easily detached from their supports so that you can examine the bird on its own. 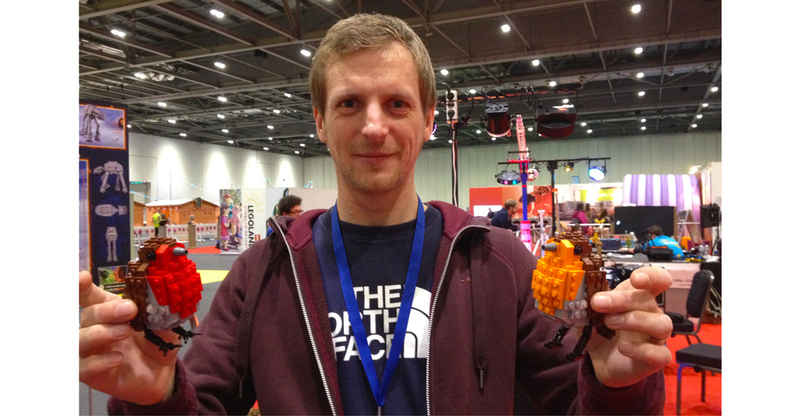 The task of amending Tom's designs was taken up by Steen Sig Andersen, who has been a Designer at The LEGO Group since 1981, and Tom was thrilled to have his precious friends in such capable hands! I don't want to describe the build in massive detail, but if you're desperate to see lots of stages, other fan sites like Eurobricks are publishing detailed build shots. I will say that each bird is quite different in its construction and the way that Steen (and whoever created the instructions) have organised the flow of the build have done a spectacular job. When I spoke with Tom at the show last week, conversation naturally turned to the changes that were made to his model so I'll share these with you instead. Tom was amazed by the brilliant job that Steen did, especially as he was simply working from photographs - there was never a need for Tom to send the models to Billund. You won't easily spot differences between Tom and Steen's robins from the outside - well, apart from the fact Tom brought along a differently coloured version! - but there are massive changes inside. Much like a Lowell Sphere, the robin requires a core that has studs on all six sides and Steen has engineered a robust solution. The process of assembling this core is cleverly done, especially Steen's solution to creating the four connecting studs you see here in the centre in Black, which requires a 180° reversal of the 2x2x2/3 SNOT brick (Design ID 99206). Tom also showed me the changes to the underside of the robin and was mildly amused that I wanted to take shots of what I described as their bird bums, but he was quick to point out that "Steen's bum is better than mine". You can make out (on the left) that Tom used 1x2 hinge bricks (Design ID 3937/3938) to attach the tail; Steen has created a stronger and more realistic tail connection using clips and bars, and gave more shaping to the... er... bum. No doubt there's a correct birdy term for that. 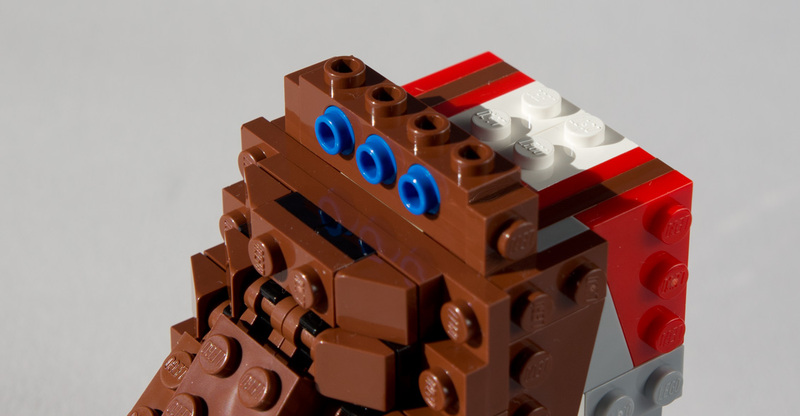 At the back of the neck, Steen opted to create a 1x4 SNOT brick by using a Technic brick with half-pins. 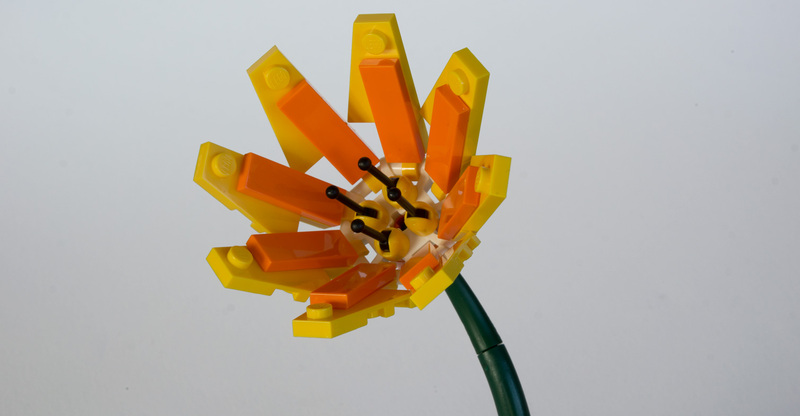 For anyone who's been an AFOL for any length of time this is a common technique but it's not common in official sets since there are so many different SNOT bricks available now. But 1x4 SNOT bricks don't exist in Reddish Brown, and it would have been pointless for Steen to have one created because he could not have used one here in any event. It would have been an illegal build as there are parts added above which rest on the studs of the Technic brick - which are of course hollow. SNOT bricks have regular studs with the LEGO logo embossed on them; this lettering increases the height of the stud and would have prevented the parts above sitting completely flat. There are no completely new elements in the robin, but a couple worthy of note as they're new enough. The Bright Red [TLG]/Red [BL] jumper plates (Element ID 6092565 | Design ID 15573) are the new style that permit a central stud underneath, which BrickLink indicates have only appeared in the San Diego Comic-Con 2014 exclusive The Ghost Starship so far. 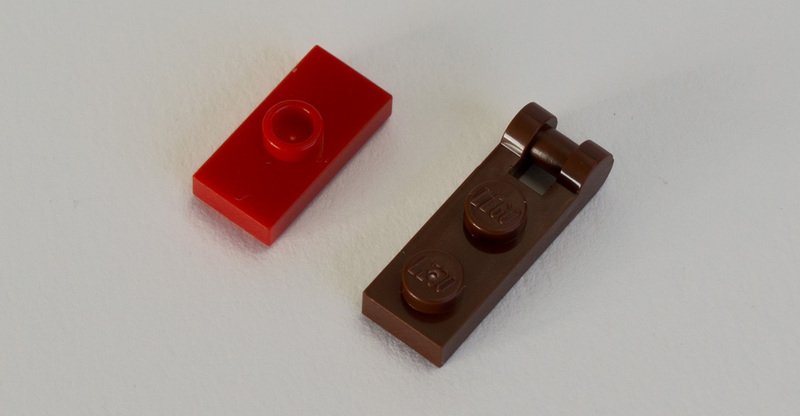 The bars that attach the tail have only been seen in Minecraft sets so far; Reddish Brown 1X2 plates with bar handle on the short side (6102975 60478). Strangely, the T-bar piece newly provided in Black in Minecraft spiders is not used for the robin's feet; instead it's just the usual Light Bluish Gray which stands out against the other Black parts used. That's a shame - I might change mine out if I get hold of some soon. It's possible that this part is "IP locked", meaning it can only be used in Black for Minecraft for now... but hopefully not. There have been more exterior changes to the jay than the robin, but they are only noticeable if you hunt them out. It's hard to tell from the terrible picture, but Tom's original uses Sand Blue which Steen replaced with Medium Stone Grey [TLG]/Light Bluish Gray [BL]. I can only assume he didn't have enough colour changes available to him to bring these parts back into production, and admittedly they are pretty similar colours. 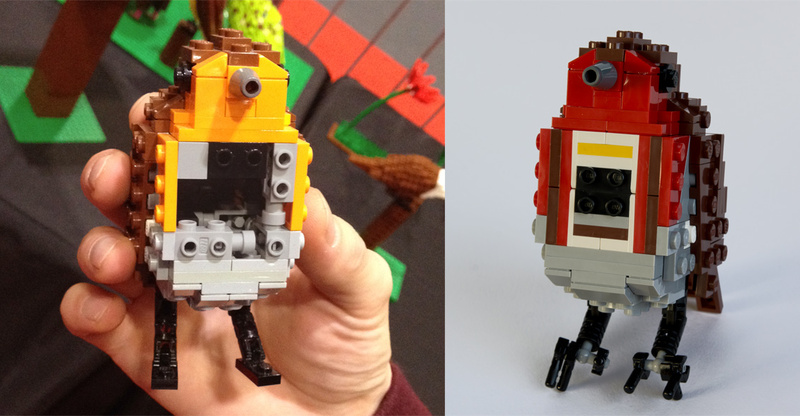 Again, the significant changes are inside the bird. Tom's solution to attach the wings at an angle with some rotation by connecting to a single stud on a hinge brick was ingenious but unstable. In Steen's version the new cup connector with friction comes to the rescue - this is a perfect example of how this new part makes difficult jobs simple. 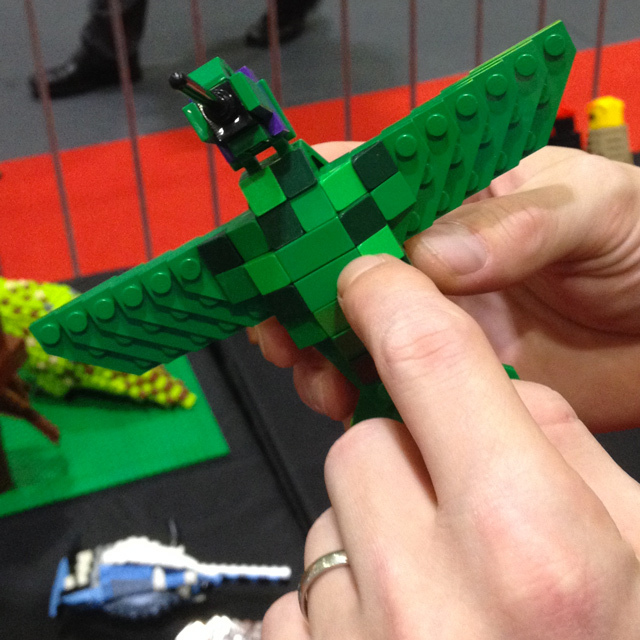 You can even wiggle the wings a little! As with the robin, the jumper plates in the jay are the new style and here they are Medium Blue (6092601 15573). 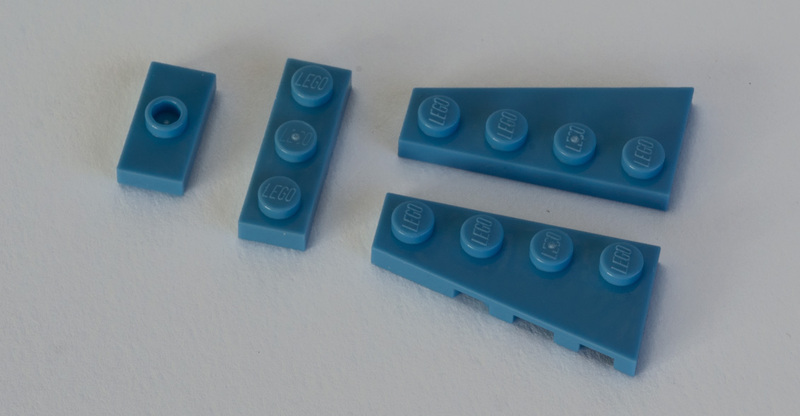 A few parts in Medium Blue have had to be brought back into production because each has only ever appeared in one set, some time ago: 1x3 plates (6070671 3623) which were in 2005's 4768 The Durmstrang Ship and 4x2 wedge plates in left (6111370 41770) and right versions (6111401 41769) from 2002's 4585 Nitro Pulverizer. The flower that Tom designed for his hummingbird has made it to the set with some revisions. Gone is the mildly dodgy technique of threading 1x1 round bricks onto tubing to create the curved stem; instead Steen has used an Earth Green [TLG]/Dark Green [BL] dinosaur tail (not seen in sets since 2008). Tom chose Red for his petals but this has been changed to Bright Yellow [TLG]/Yellow [BL] and Bright Orange [TLG]/Orange [BL] which I don't think works as well against the green bird. 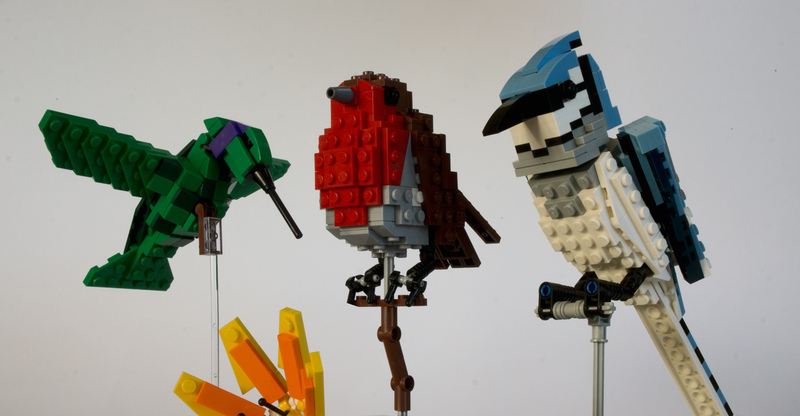 However it makes a lot of sense when all three birds are seen together, as now his set contains models in yellow, green, red and blue - core colours which the LEGO brand is associated with, and it really lifts the overall set. The construction of the hummingbird requires a 180° reversal to attach its back. Tom achieved this using parts long out of production due to their tendency to snap; Design IDs 4275 and 4276 from the 'finger hinge' family. These compact hinges are sorely missed by AFOLs for several reasons, including the 180° reversal technique which Tom employed - to enable studs to point outwards from both the top and bottom. 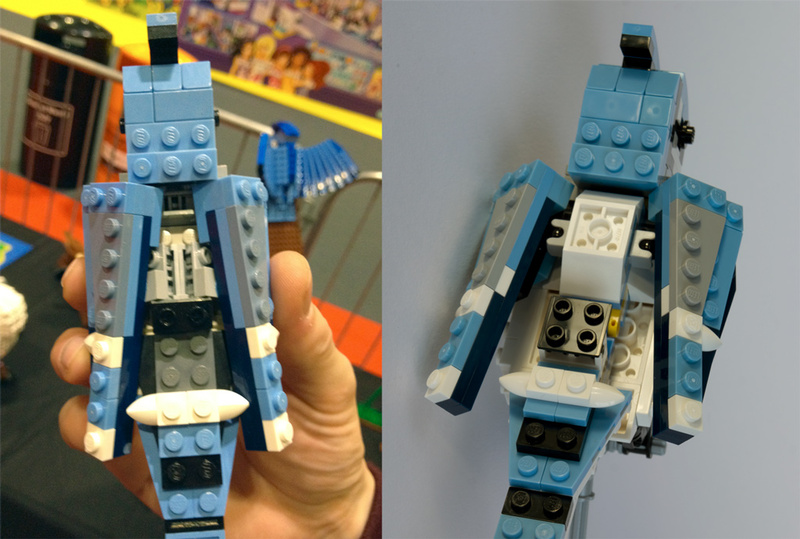 Steen's chosen solution is to build two stacked Technic plates into the body of the bird so that a 2x2 plate with inverted pin (seen in Light Bluish Gray) can be inserted into the bird's back. It's a legal technique, but not ideal as the fit is not snug, leaving a small gap between the attached sections. It's nothing to worry about though; these models contain many small gaps in their designs which you don't notice. Tom used some Bright Green cheese slopes on his hummingbird which Steen omitted; I really can't think why. Given how faithfully Steen replicated the exterior of Tom's birds, it seems an odd creative choice to change this, and I can't imagine it was a cost or production decision. Perhaps having three green shades of the same part was deemed too confusing. On to the parts, and finally there are a couple of unique recolours provided - sort of. 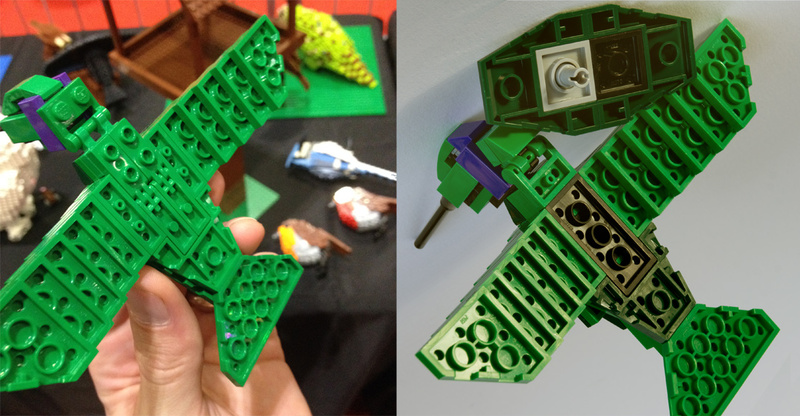 4x4 triple wedge bricks in Earth Green (6101853 48933) are used for the hummingbird's back, but BrickLink inventories show them as also appearing in 2015's 31031 Rainforest Animals, a set which will presumably be available at the same time as Birds, if not already. 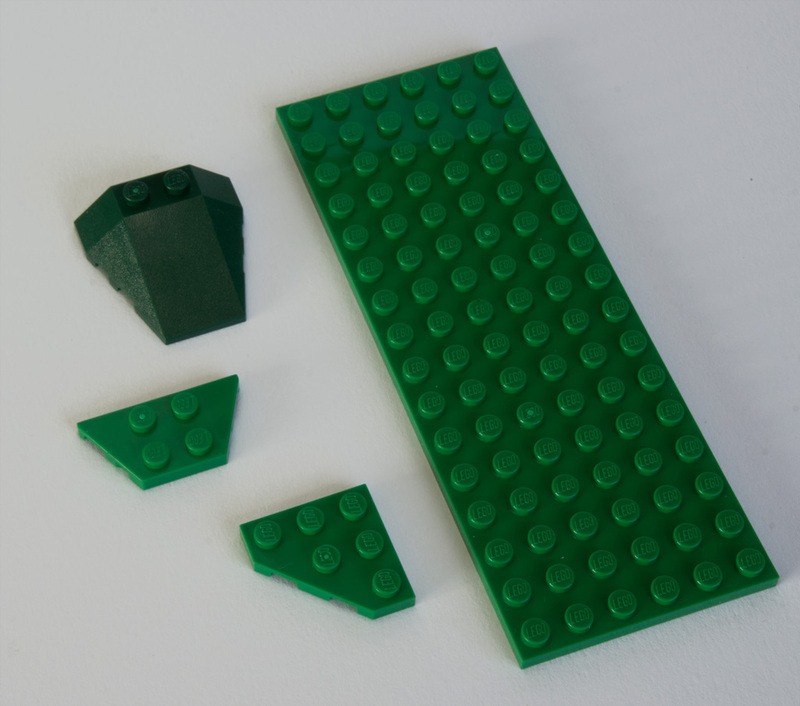 However there is a recolour that seems to be unique to this set for now at least and it's one that will prove useful for landscaping (amongst other things): the 2x4 trapezoid wedge plate in Dark Green [TLG]/Green [BL] (6100220 51739). I'm surprised it's never been used before. It has however appeared in Earth Green - and frankly, Steen could have gotten away with using Earth Green here in the hummingbird, so it's rather nice we get it at all. (Perhaps, like the Earth Green triple wedge brick, the recolour was originally ordered for a 2015 set and so was available to him anyway.) Another wedge plate in the same shade of green is the 3x3 with a 45° corner (6114672 2450); you can't miss these as twelve of them make up the wings. These have been brought back into production after a long absence: they appeared in ten sets from 1996-2000. Also worthy of mention is the useful 6x16 plate (6032912 3027). Although this did appear recently in 60025 Grand Prix Truck , prior to that it had only been used in two sets in 1999 and 2000. The first 2015 set I've gotten my hands on just might prove to be one of my favourites of the year! From the moment you see the box to when you finally arrange your completed species on a shelf, I found this set an absolute joy. Despite being basic plates, the models are extremely accurate but more than that, it's the creative spark of personality that Tom brings to every bird which really sets them apart. Compared to the animals you get in the Creator line, these creations are several steps higher in terms of being exquisite and complex geometrical builds - more akin to a Chinese puzzle. In fact if I had to compare them to another LEGO theme it would be Architecture... luxury box and instructions, classy display presentation, advanced techniques and an inventory consisting mostly of basic parts. For adults who've not built a LEGO set in decades, this prevalence of simple plates should make them comfortable that this brand is indeed not "full of specialised parts you can only use for one thing", whilst the specialised parts that have been included should open their eyes to how LEGO has advanced over the years, along with the advanced techniques. We love new elements here at New Elementary and there wasn't a massive amount on offer here, but the green parts are pretty useful I reckon and it's great to see some basic parts back in production. A shame Sand Blue did not make an appearance, but really I found almost nothing to complain about with this set. In a super-ideal world I would have been thrilled to find some never-before-moulded Trans-Clear parts included in the stands: namely the hummingbird's Reddish Brown plate with handle and the robin's axle. But I'm dreaming. This set perfectly reflects LEGO's brand values in so many ways and I'm feeling confident that it will be a massive hit with pretty much everyone that buys it, although of course younger kids may prefer something with flick-fire missiles. I guess they could add some... that would be cool... but no, they are fantastic display pieces, although you can easily detach most of them from their supports for a bit of swooshing! 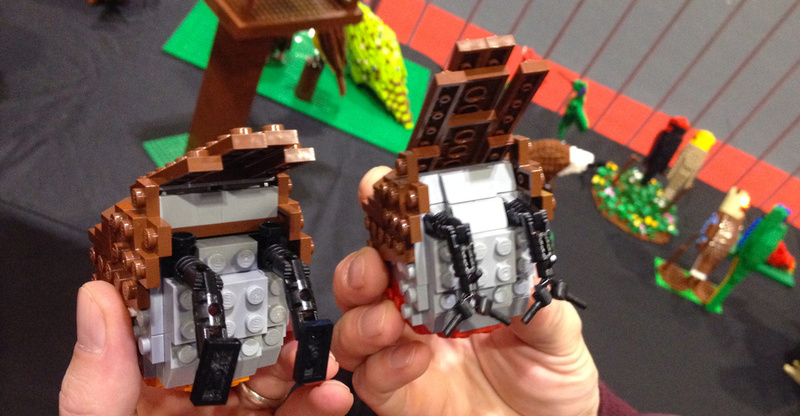 My thanks to LEGO's Community & Events Engagement Team for providing this set and to Tom Poulsom for explaining his models. 21301 Birds is released 1 January 2015 priced 44.99 EUR / 39.99 GBP / 44.99 USD. Consider using our affiliate links to buy it when it comes out (or anything this Christmas! ); this helps support New Elementary. 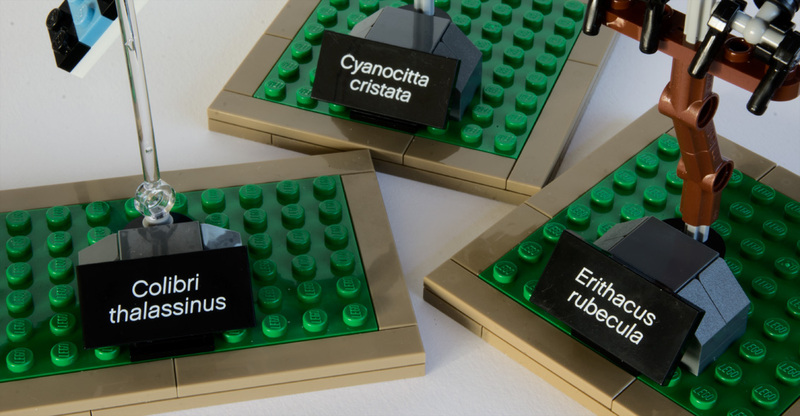 "SNOT bricks have regular studs with the LEGO logo embossed on them; this lettering increases the height of the stud and would have prevented the parts above sitting completely flat." I have to quite disagree. If stud on stud spacing were perfect, the studs would be 1.6mm tall. If you play around with hollow studs even, you'll realize that they are 1.7-1.8mm tall. The LEGO logo makes little to no difference in the height. The stud itself is the issue. Interesting. I've never measured them, I'm basing this purely on Jamie's 'Stressing the Elements' presentation from years back. I thought (from the same presentation, I believe) that the reason Technic half-pins were seldom used with SNOT was because Technic holes sat a bit higher in the brick than studs on SNOT bricks, so when placed side-by-side, the Technic combination would be misaligned with both SNOT bricks and the top of the brick, being raised fractionally. 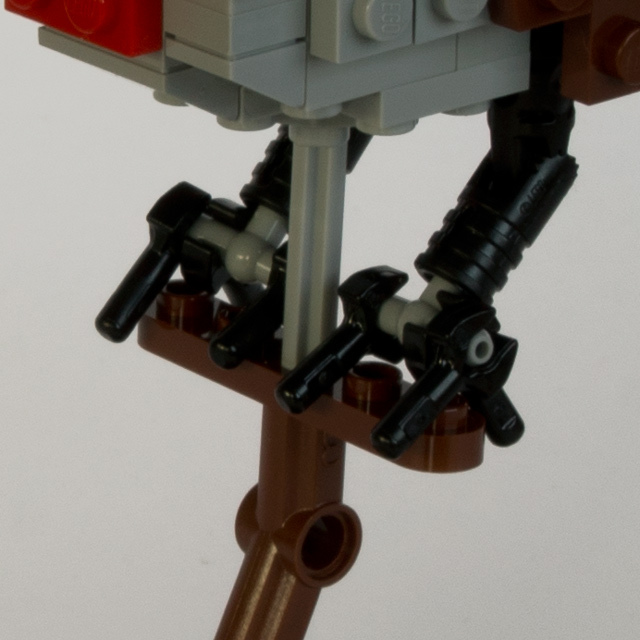 In this instance, no parts are connected to the top of the Technic brick, so that issue is not a problem. So it's interesting but not too surprising that they weren't in yours.